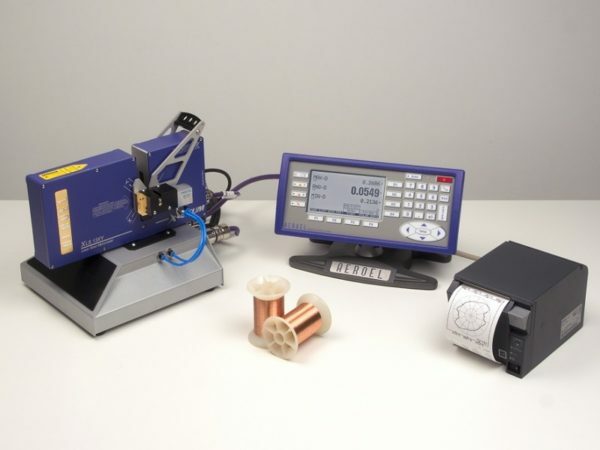 The Super-Wirelab.XY is a table top laser micrometer for the wire industry. 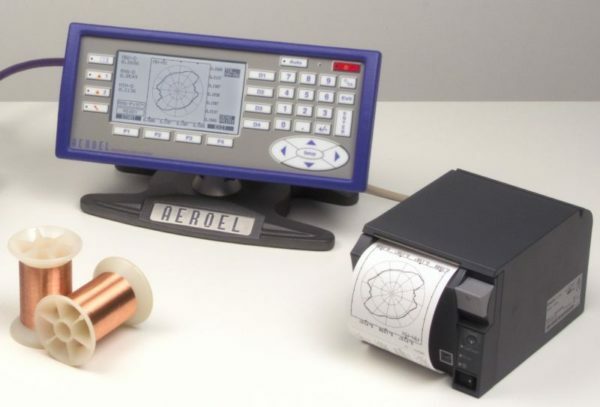 Manufactured by Aeroel, it is an ultra-accurate bench top laser gauge which allows for the analysis of diameter and ovality of wire, fibre, thin cable or rectangular-section products. 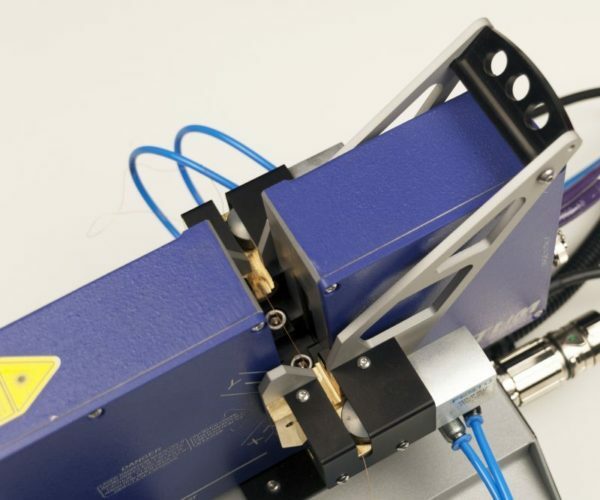 One of several applications includes diameter mapping to identify die wear and defects in extruded and drawn products including wire and optical fibres. 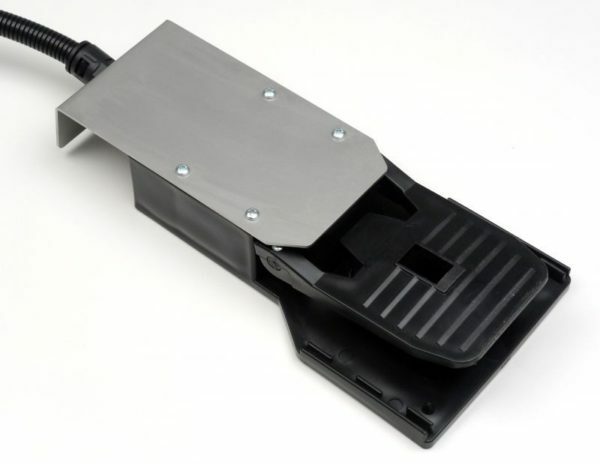 Super-Wirelab builds on the popular and proven Wirelab unit with the addition of an innovative foot-driven pneumatic clamping unit to hold the specimen under tension, and a magnetic angle encoder – allowing rotation of the wire in the gauge, to map its entire profile in a matter of seconds. 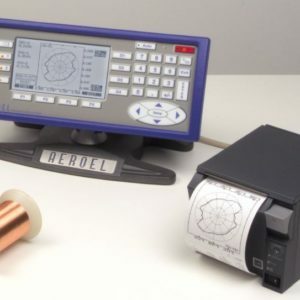 Like the other gauges in the range, Super-Wirelab uses AEROEL’s patented calibration and true thermal compensation protocols to provide reliable results in the metrology room or on the factory floor. The Super-Wirelab.XY is one of a number of offline diameter measurement solutions we supply to the wire industry. We can also custom design solutions to suit your specific requirements – get in touch with your project details to find out more. 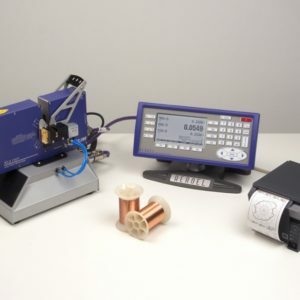 The Wirelab family of laser diameter micrometers has been specifically designed for offline measurement in the wire Industry. It provides highly accurate finished diameter measurement and can be used to measure the ovality of drawn wire. 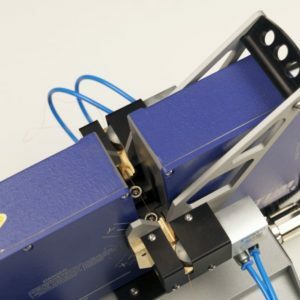 The dual axis gauge provides bench-top dimensional monitoring and, by using a rotating fixture, the wire can be rotated in the beam and measured in different points around the wire. The Super-Wirelab’s angle encoder allows for the whole profile to be measured and a cross-section of the wire generated. A detailed statistical report of measured product dimensions can be printed for every batch, including a polar plot printout for the wire cross-section. No other system offers the simplicity or the performance of the Wirelab for offline measurement and wire diameter mapping. (1) For Ø≤0.1mm, for smaller diameters the field is proportionally reduced up to 1 x 1mm for Ø = 0.05mm. (2) Maximum measureable diameters limited by the fixture configuration. (3) Related to the average diameter (X=Y)/2. The value is inclusive of the Aeroel’s masters uncertainty (± 0.3µm). (4) For Ø≤0.1mm. Per Ø>1mm the linearity is ±1µm. (5) Maximum measurable shift of the average diameter (X+Y)/2, when a master is moved along the two S and Y axes crossing the centre of the field, checked with Ø=1mm. the value is inclusive of the Aeroel’s masters uncertainty (± 0.3µm). (6) The reduced field is 2x2mm. (7) For Ø≤0.5mm. For Ø>0.5mm the repeatability is ± 0.3µm. (8) For Ø≤3mm. For Ø>3mm the repeatability is ± 1.5µm. (9) Elliptical spot. “s” is the thickness and “I” is the width. (10) This is the measuring error due toa change in the ambient temperature when measuring a part with zero thermal expansion coefficient (INVAR). This is specified for gauges using a software PRESET for the NO-VAR option and when the rate of change of the ambient termperature is lower than 3o/h. When the NO-VAR option is ENABLED, the gauge thermal expension coefficient is programmable by the user. 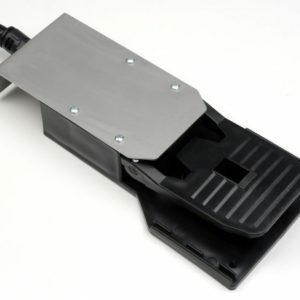 (11) Laser sensor, base and fixture in starting posiion. Offline measurement of cable, wire, fibre or rectangular section product.